This is not the latest version of FileOptimizer available. This package was approved by moderator pascalberger on 3/5/2017. 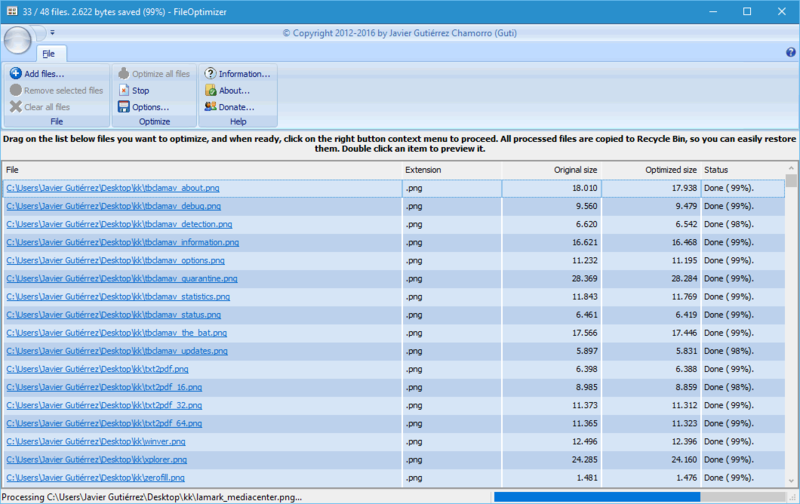 FileOptimizer is an advanced file optimizer featuring a lossless (no quality loss) file size reduction that supports: .3GP, .A, .AAI, .AC, .ACC, .ADP, .AI, .AIR, .APK, .APNG, .APPX, .APR, .ART, .AVS, .BAR, .BMP, .BPL, .BSZ, .CBT, .CBZ, .CDR, .CDT, .CHI, .CHM, .CHQ, .CHS, .CHW, .CPL, .CSL, .CSS, .DB, .DCX, .DEB, .DES, .DIB, .DLL, .DOC, .DOCM, .DOCX, .DOT, .DOTM, .DOTX, .DRV, .DWF, .DWFX, .EASM, .EML, .EMLX, .EPDF, .EPRT, .EPUB, .EXE, .FAX, .FB2, .FDF, .FITS, .FLA, .FLAC, .FPX, .FXG, .GALLERY, .GALLERYCOLLECTION, .GALLERYITEM, .GIF, .GRS, .GZ, .HDR, .HRZ, .HTM, .HTML, .ICO, .INK, .IPA, .IPK, .IPSW, .ITA, .ITS, .ITZ, .JAR, .JFI, .JFIF, .JIF, .JNG, .JP2, .JPC, .JPE, .JPEG, .JPG, .JPS, .JS, .JSON, .KML, .KMZ, .KSF, .LIB, .LIT, .LUA, .LUAC, .LXF, .LZL, .M4A, .M4B, .M4P, .M4R, .M4V, .MAX, .MBX, .MCE, .MDB, .MDT, .MDZ, .MHT, .MHTML, .MIC, .MIF, .MIFF, .MIX, .MIZ, .MKA, .MKS, .MKV, .MMIP, .MNG, .MP3, .MP4, .MPD, .MPO, .MPP, .MPT, .MSC, .MSG, .MSI, .MSP, .MST, .MSZ, .MTV, .MTW, .MVZ, .NAR, .NBK, .NOTEBOOK, .O, .OBJ, .OCX, .ODB, .ODF, .ODG, .ODP, .ODS, .ODT, .OEX, .OGA, .OGG, .OGV, .OGX, .OLE, .OLE2, .ONE, .OPT, .OSK, .OST, .OTB, .OXPS, .P7, .PALM, .PBM, .PCC, .PCD, .PCDS, .PCX, .PDB, .PDF, .PFM, .PGM, .PIC, .PICON, .PICT, .PK3, .PNG, .PNM, .PNS, .POTM, .POTX, .PPAM, .PPM, .PPS, .PPSM, .PPSX, .PPT, .PPTM, .PPTX, .PSB, .PSD, .PTIF, .PTIFF, .PUB, .PUZ, .R2SKIN, .RDB, .RFA, .RFT, .RMSKIN, .RTE, .RVT, .S3Z, .SCR, .SGML, .SLDASM, .SLDDRW, .SLDM, .SLDPRT, .SLDX, .SOU, .SPL, .SPO, .STZ, .SUN, .SVG, .SVGZ, .SWC, .SWF, .SYS, .TAR, .TGZ, .THM, .TIF, .TIFF, .VBX, .VCARD, .VCF, .VDX, .VICAR, .VIFF, .VLT, .VSD, .VSS, .VST, .VSX, .VTX, .WAL, .WBA, .WBMP, .WEBP, .WIZ, .WMZ, .WPS, .WSZ, .XAP, .XBM, .XHTML, .XL, .XLA, .XLAM, .XLC, .XLM, .XLS, .XLSM, .XLSX, .XLTM, .XLTX, .XLW, .XML, .XMZ, .XNK, .XPI, .XPM, .XPS, .XSF, .XSL, .XSLT, .XSN, .XWD, .ZIP, STICKYNOTES.SNT, and THUMBS.DB file formats among others. It keeps the behavior of the file untouched, but with its size reduced thanks to several recompression and optimization techniques. Alternatively you can add the files and directories to process on the program's command-line, or dragging them to the executable file. A context menu for Add files, also does it. FileOptimizer is provided free of charge under the LGPL. Of course if you are using it in a commercial environment, a small donation will be highly appreciated. Donation links can be found on the project homepage. Operating System: Windows 2000, XP, 2003, Vista, 2008, 7, 8.x, 2012, 10 or 2015 (x64 compatible). 32 Mb of free memory. 50 Mb of disk space available. The FAQ can be found on the project homepage. Uninstall-ChocolateyPackage $packageName $installerType $silentArgs "$path\Uninstall.exe"
Uninstall-ChocolateyPackage $packageName $installerType $silentArgs "$path86\Uninstall.exe"
Brand new FileOptimizer icon (Thanks Dorel Megaleechers.com). Added descriptions in INI file to make it easier and safer to be modified. Migrated from smpdf to cpdf (maadjordan). Fixed a bug that could show optimized sizes larger than original, when the plugin execution increased it. It was only cosmetic, and optimized size, never was larger (Pepper Andrino). Ghostrcript is automatically disabled when no downsampling is selected, because it is always downsampling images even if -dDownsampleColorImages=false -dDownsampleGrayImages=false -dDownsampleMonoImages=false are specified (olavrb). Make sure TempDirectory is created to avoid certain plugins crash (Newtomic). Patched Guetzli and Mutool plugins to be compatible with Windows XP (thanks Jaff for the patch). Switched to libwebp without WIC codes to keep Windows XP compatibility (Jaff). Fixed not properly passing PDF profile to Ghostcript (#9 Runer112). Updated libwebp to 0.6.0 RC3. Updated mozjpeg to 3.2 (Thanks AiZ). Updated Leanify to 0.4.3.180 daily binaries. Updated ImageMagick 7.0.4.7 with HDRI support. Updated pngquant to 2.8.1 (dado023). This discussion is only about FileOptimizer and the FileOptimizer package. If you have feedback for Chocolatey, please contact the google group. Tell us what you love about the package or FileOptimizer, or tell us what needs improvement. Deployed from e27d7a207f. You are on web.4. UTC time is currently 19 Apr 2019 11:35:30 +00:00.